The Phantom 4 Pro+ from DJI boasts a 3-axis-stabilized gimbal camera with a 20MP, 1" CMOS sensor capable of shooting up to 4K/60fps video and well as photo bursts at up to 14 fps. The hull has been updated from the previous Phantom 4, now featuring magnesium alloy construction for increased rigidity and reduced weight. The FlightAutonomy system adds dual rear-vision sensors plus infrared sensing for a total of five directions of obstacle sensing and four directions of obstacle avoidance. 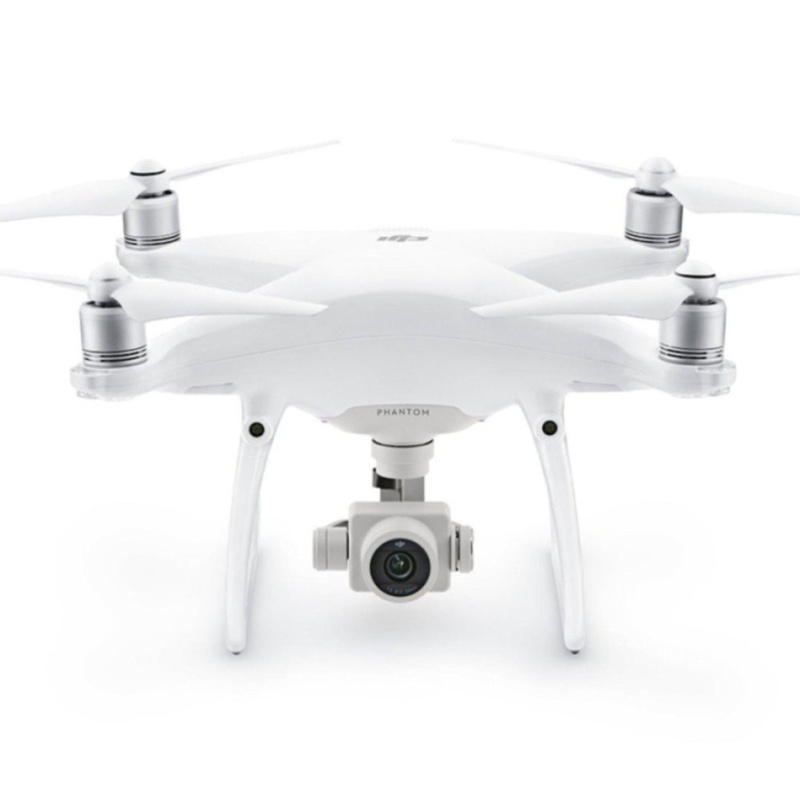 Compared to the Phantom 4 Advanced variant, the Pro features the noted four, rather than two, directions of obstacle avoidance and offers a 5.8 GHz channel for the Lightbridge link, in addition to 2.4 GHz. The Phantom 4 Pro+ features a high-luminance display integrated into the remote controller. Sensor size is often more important to image quality than the number of pixels, because a larger sensor has dynamic range, better signal-to-noise ratio, and boosted low light performance. The 1" 20MP CMOS sensor in the Phantom 4 Pro+ is almost four times the size of the Phantom 4's 1/2.3" sensor. It uses larger pixels and has a maximum ISO of up to 12,800 as well as increased contrast. An enhanced video processing system allows video to be captured in cinema- and production- optimized DCI 4K (4096 x 2160) at 60 fps and a bitrate of 100 Mbps. The Phantom 4 Pro+ also supports the H.265 video codec at 30 fps in 4K resolution. For a given bitrate, H.265 doubles the amount of image processing as H.264, resulting in significantly enhanced image quality from a more efficient compression. Record in the high dynamic range D-log mode to make the most of this image data for color grading. The Phantom 4 Pro+ camera has an aerial-optimized f/2.8 wide-angle lens with a 24 mm equivalent focal length. It features eight elements — two aspherical — arranged in seven groups that fit into a smaller, more compact frame. Its images are consistently detailed with low distortion and low dispersion, ensuring that photos and videos are sharp and vivid. Capturing objects moving at high speed has always been a challenge for flying cameras using an electronic shutter. This is why the Phantom 4 Pro+ is the first DJI Phantom to use a mechanical shutter and a large-aperture prime lens. A maximum mechanical shutter speed of 1/2000-second eliminates motion blur and "jello effect" caused by shooting a fast moving object with a rolling electronic shutter. The electronic shutter has also been improved with a max shutter speed of 1/8000-second, and a there is Burst Mode shoot capable of shooting 14 fps at 20 megapixels to catch the perfect moment. The Phantom 4 Remote Controller with 1080p Display controller integrates an upgraded Lightbridge HD video transmission system that adds 5.8 GHz transmission support. The ability to choose between 2.4 GHz and 5.8 GHz allows pilots to cut through interference and eliminates image lag caused when flying in an area with extensive 2.4 GHz frequency use. Normally, Wi-Fi video transmission systems use a 2.4 GHz frequency to work with a controller using a 5.8 GHz frequency, as this prevents interference that can occur when both use the same frequency. The Lightbridge HD video transmission system used in the Phantom 4 Pro+ uses TDM (Time Division Multiplexing) to transmit signals, allowing it to send controller signals and receive video transmission signals at the same frequency. As the 2.4 GHz frequency band is often affected by Wi-Fi, 4G cell towers, and other types of interference in urban areas, a 5.8 GHz band will increase transmission reliability. When switched on, the Phantom 4 The Phantom 4 Pro+ features a high-luminance display integrated into the remote controller. evaluates local signal levels, automatically choosing the transmission frequency with the lowest level of interference. This enables a maximum video transmission range of 4.3 miles. A 5.5" 1080p screen integrated w offers 1000 cd/m² of brightness, more than twice as bright as conventional smart devices. It makes bright, vivid colors easily visible in direct sunlight. With this screen, a mobile device is not required, simplifying pre-flight preparations. As the DJI GO app is built into the screen, hardware and software can be fully optimized, further reducing video lag. Integration of an HDMI port, microSD card slot, microphone, embedded loudspeaker, and Wi-Fi connection allow images to be edited inside DJI GO to be shared almost instantly. Lastly, a five-hour battery life makes the Phantom 4 Pro+ a complete aerial imaging solution. In its Return to Home mode, the Phantom 4 Pro+ can automatically choose the best route to return home depending on environmental conditions. It records its route as it flies, allowing it to return along the same route avoiding obstacles if the control signal is disconnected. Based on its altitude at the time of disconnection, the Phantom 4 Pro is also able to adjust its flight path to avoid obstacles it has seen during its flight. At takeoff, the Phantom 4 Pro+ will record the scene below and compare its recording with what it sees as it returns, for more precise landing. It can also detect the ground to see whether there is suitable spot for landing. If any obstacles are found, or there is water on the ground, it will alert the pilot and hover at an appropriate height, helping the aircraft to land more safely. With Gesture Mode, selfies can be captured using a few gestures without the remote controller. Computer vision technology allows the Phantom 4 Pro+ to take instructions through gestures. The subject simply lifts their arms when facing the camera and the aircraft will recognize this movement by locking on and placing the subject in the center of the frame. When ready for a photo, the subject holds their arms out to signal the aircraft. A three second countdown will begin, making time to strike a pose, allowing moments to be captured without the remote control. Different productions require different flight characteristics, and the Phantom 4 Pro offers three modes for flight: P, A and S. Switching between them allows pilots to get the control they need, whether they seek smoothness, simplicity, intelligent navigation, or speed. In Position Mode (P), TapFly, ActiveTrack, obstacle sensing and positioning features are available. Sport Mode (S) adds extra agility and higher speed, reaching 45 mph . Attitude Mode (A) switches off satellite stabilization and holds the Phantom 4 Pro+'s altitude. It is ideal for experienced pilots looking to capture smoother footage. Tripod Mode, which limits speed to 4 mph provides precision control for fine framing and indoor flying. Both the infrared sensing system and vision sensors are enabled in these modes for a safer flight experience. The Phantom 4 Pro+ features dual compass modules and dual IMU units, making it more reliable when compared to many hexacopters and octocopers. Compasses and IMUs are important sensors to ensure a stable flight and the Phantom 4 Pro+ constantly compares the data it receives through both pairs. This data is run through various algorithms to check accuracy, and any inaccurate data is simply discarded without affecting flight, keeping flight steady and reliable. Professional aerial imaging benefits from longer flight times. The Phantom 4 Pro+ features a maximum flight time of 30 minutes, providing more time in the air to capture the perfect shot. The DJI GO app shows battery lifetime and calculates remaining flight times according to distance traveled and more. It will give alerts when it reaches a minimum safe amount required for a safe journey back to the takeoff point. An advanced battery management system is also in place to prevent overcharging and over draining. When placed in longer term storage, batteries will discharge power to maintain good health. Box Dimensions (LxWxH)16.8 x 13.5 x 9.2"